The job of a non-executive director on a board is a tough one. For many reasons. Not least because they are largely reliant on the executives for the information they receive about the company. 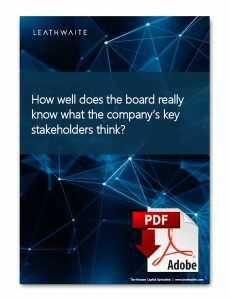 This is not to imply that a company’s executives are deceitful or neglectful, but to what extent do the non-executives really understand how the company’s stakeholders feel about the company and its board? In her latest whitepaper Vicky Griffiths, Head of Leathwaite’s Board Practice, examines if effective communication channels exist between the board and the company’s key stakeholders (which, often, they do not), whilst providing insight on the most effective ways for the non-executive directors to engage with those stakeholders and ensure that they are receiving honest and meaningful feedback.